The World's only comic-making game! Mangaka if a fast-paced, creative card game where you and your friends draw hilarious comics in five-minute rounds. Combine Theme Cards and Trend Cards for endless story ideas so you'll never play the same game twice! Work with wild Themes like Cats, Bling, and Astophysics... or Rival Schools, Dragons and Zombies. Earn Fame by following market Trends demanding Science Fiction, Sports or Romance in your story. When time is up, the player with the most Fame wins! 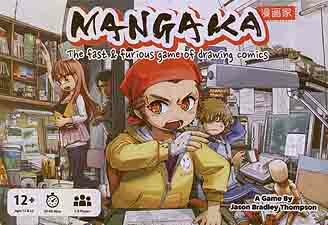 Mangaka combines the fun of drawing with friends with the strategy of a card game, where cleverness, silliness and quick wit matter much more than how well you draw. Grab a pen, draw your cards, and may the best mangaka win!